Featured amenities include limo/town car service, express check-in, and express check-out. Planning an event in Istanbul? This hotel features 323 square feet (30 square meters) of event facilities. For a surcharge, guests may use a roundtrip airport shuttle (available 24 hours) and a cruise ship terminal shuttle. Make yourself at home in one of the 16 air-conditioned rooms featuring kitchens with refrigerators and stovetops. Your memory foam bed comes with Frette Italian sheets, and all rooms are furnished with single sofa beds. 81-inch LCD televisions with satellite programming provide entertainment, while complimentary wireless Internet access keeps you connected. Conveniences include phones, as well as safes and desks. 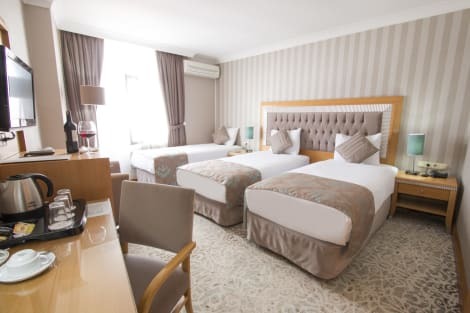 Hotel Next2 sits in the historic Beyoglu district, a 10-minute walk from Taksim Square and moments from the shops, restaurants, and galleries of Istiklal Street. The hotel serves a traditional Turkish buffet breakfast each morning, and the reception staff can help you with booking tours. Modern, air-conditioned suites have free wifi, flat-screen TVs, DVD players, en-suite bathrooms and some also have a kitchen. Duplex rooms have Jacuzzi in the bathroom. Hotel Villa Zurich is located in the Beyoğlu District, a 10-minute walk away from the Istanbul Museum of Modern Arts and the shops and dining options of Istiklal Avenue, which is 500 m away. 500 m from Istanbul's lively Taksim Square, Hotel Villa Zurich offers sweeping Bosphorus views from its rooftop terrace. The airy Sur Fish Restaurant serves fish specialties. The guest rooms at Villa Zurich Hotel combine elegant velvet details and dayligh shades. They feature private bathrooms with tub and some rooms also have a spacious work desk. A rich buffet breakfast is served on Villa Zurich's lovely rooftop terrace. There is also a lobby bar, with décor from the 1960s and stained-glass windows. With a stay at Odda Hotel - Special Class, you'll be centrally located in Istanbul, steps from Istiklal Avenue and 9 minutes by foot from Taksim Square. 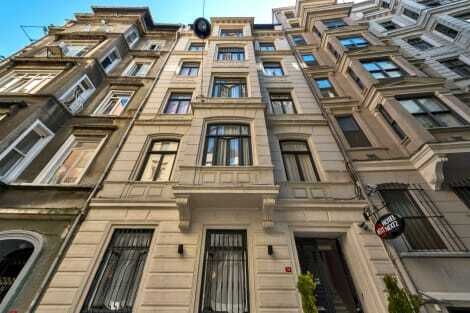 This hotel is 0.4 mi (0.6 km) from Pera Museum and 1.4 mi (2.2 km) from Galata Tower.